Many of the changes in land-surface temperature follow a simple linear combination of volcanic forcing (based on estimates of stratospheric sulfate injection) and an anthropogenic term represented here by the logarithm of the CO2 concentration….When we included solar forcing we found that the solar variability record assumed by the IPCC did not contribute significantly to the fit of historic temperature. ….After accounting for volcanic and anthropogenic effects, the residual variability in land-surface temperature is observed to closely mirror and for slower changes slightly lead variations in the Atlantic Multidecadal Oscillation Index. This is consistent with both the land and North Atlantic responding [to] the same unknown process….Though non-trivial, this number is small compared to the anthropogenic changes that appear to have occurred during the last century. In English, this means that (a) volcanoes cause short-term spikes in the climate record, (b) changes in solar activity have virtually no effect, and (c) periodic oscillation in North Atlantic sea temperatures accounts for some of the variability we see in the temperature record. 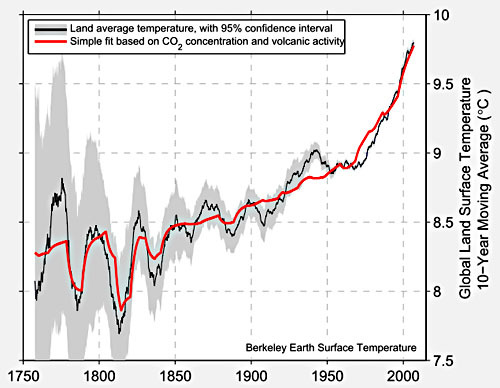 However, the primary cause of warming since 1800 is anthropogenic. That is to say: humans did it. Carbon dioxide has produced virtually all of the warming that we see around us today, at the rate of about 3.1 degrees C for every doubling of atmospheric CO2. The chart below shows the close match between CO2 levels, volcanic activity, and surface temperature. This is pretty much the same result produced by the IPCC and the consensus of every climate scientist working today. The skeptics dived into the data, crunched it in an entirely different way, and came up with the same result: Global warming is real and human activity causes it.